Notes: Prospect Falls variations come from healing Gold Jigs. Prospect Falls Quests are the first column on the map. 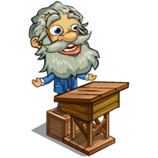 Impressive Speeches come from the Annexed Collection which drops from Healing Gold Jigs, tending their completed variations, Harvesting Nasturtium Flowers and the daily bonus of the Lawyer Shack.